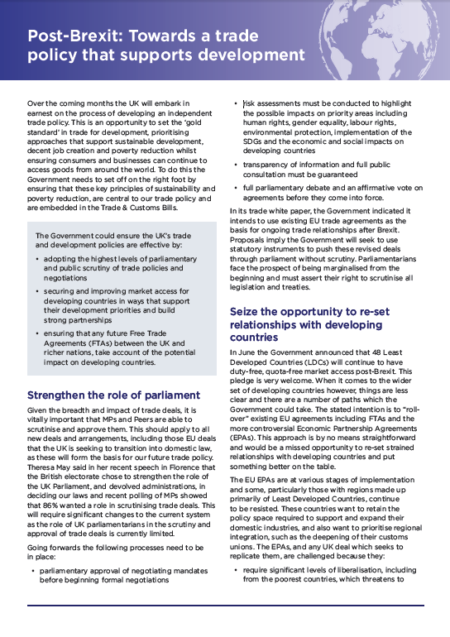 Over the coming months the UK will embark in earnest on the process of developing an independent trade policy. This is an opportunity to set the ‘gold standard’ in trade for development, prioritising approaches that support sustainable development, decent job creation and poverty reduction whilst ensuring consumers and businesses can continue to access goods from around the world. To do this the Government needs to set off on the right foot by ensuring that these key principles of sustainability and poverty reduction, are central to our trade policy and are embedded in the Trade & Customs Bills.